Jeremy Corbyn has pledged to use the backing of party members to force Labour MPs to support his agenda if he is elected leader. Calling for "real democracy", the left-winger said MPs should not "stand in the way" of "empowering party members". But fellow leadership candidate Yvette Cooper said his election could lead to a split in the party. Polls suggest Mr Corbyn is frontrunner in the race. The other candidates are Liz Kendall and Andy Burnham. The new leader will be announced on 12 September. It comes as figures obtained by the BBC show the vast majority of 189,000 trade unionists who have registered as affiliated supporters to vote in the election are members of unions supporting Mr Corbyn. The Unite union alone accounts for 110,000. Unison and the Communications Workers Union have signed up a further 40,000. 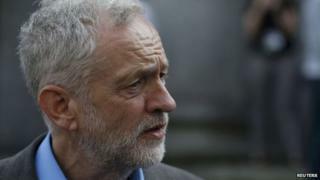 A number of Labour MPs have warned about the impact of Mr Corbyn winning the leadership. Simon Danczuk, the Rochdale MP, told the BBC "the vast majority in the Parliamentary Labour Party... will not like the direction of travel" if the left-winger wins. Ms Kendall has also indicated she may be willing to join the Labour for the Common Good group, which also includes Chuka Umunna and Tristram Hunt, and is seen as a potential resistance faction against a Corbyn leadership. But speaking to the Independent newspaper, Mr Corbyn said he would "absolutely" use support from the membership "to push our agenda up to the parliamentary party and get them to follow that." He said MPs are "not the entirety of the Labour Party", adding: "I want to see real democracy so this election gives a very strong mandate for change within our society." Mr Corbyn, who has voted against the Labour leadership on hundreds of occasions since his election as the MP for Islington North, in London, in 1983, said he had always rebelled on a point of principle. Ms Cooper told the BBC's World at One the party appeared "to be polarising" between "different extremes". "I just don't think the extremes of the party are the right place to be and are true to our values and the things we need to do to change the country for the future," she said. Ms Kendall praised the Common Group, saying: "It's a great idea. If I'm invited I would certainly go along." Meanwhile one of Mr Corbyn's prominent supporters - former leadership candidate Diane Abbott - accused his opponents of "plucking" incidents from his career to try and discredit him. Mr Corbyn has admitted meeting controversial Lebanese activist Dyab Abou Jahjah - who is banned from the UK over his views on the Middle East. Mr Corbyn said he met "many thousands of people" and that "doesn't mean that I share their views". Ms Abbot added: "To try and build a case on the basis of guilt by association is very wrong". How does it work? If no candidate wins outright with more than 50% of first preferences, whoever is in fourth place drops out and the second preferences of their backers are reallocated to the other candidates. If there is still no winner the third placed candidate is then eliminated with their second preferences similarly reallocated. The candidate who has accumulated the most votes through the different rounds then wins. Labour leadership: Is Jeremy Corbyn really going to win?